Discussion in 'Busse Combat Knives' started by David Brown, Nov 2, 2017. 1st, thank you for all the business and the continued support. 2nd, It seems to come up every time a new model is announced and/or put up for sale and when you can actually buy them. 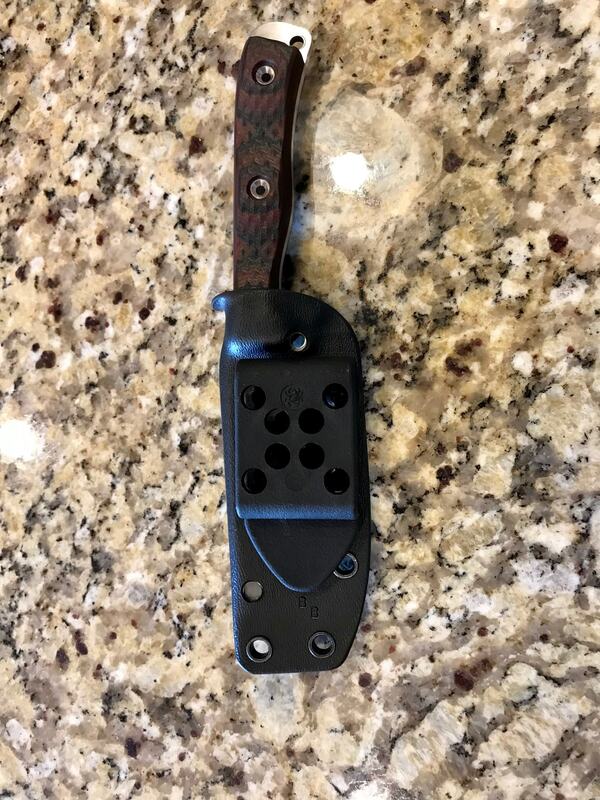 sometimes for a knife at Blade that was just debuted at the show meaning they are the very first ones available ever, a few folks every year walk from the Busse Booth to my table and ask if I have a sheath made for the brand new never released knife. I have to order, buy and wait for the shipping notices just like all my Busse Friends do. I do not receive any knives early at all, I usually get them within a couple of days of everyone else. 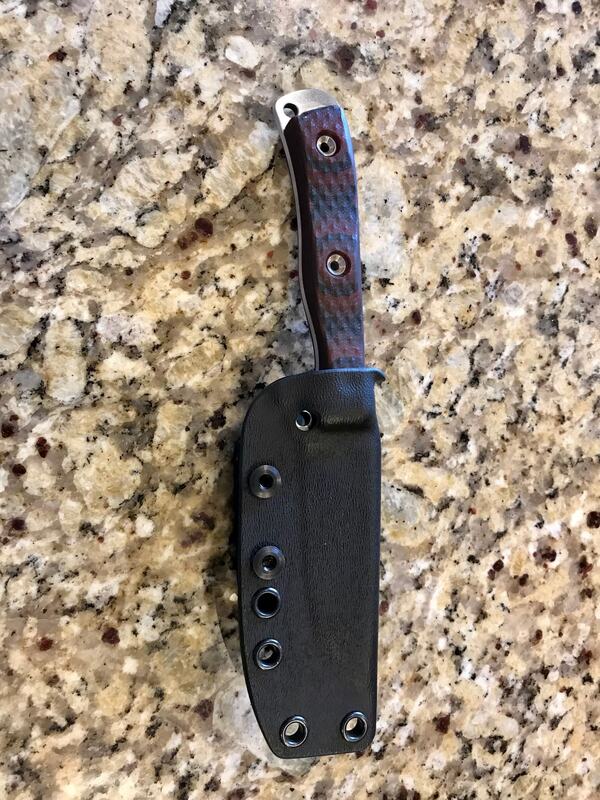 I do order every single knife that comes out of the Busse Shop and usually have them on hand, even knives from years and years ago, so that you do not have to send yours in. And thank you again for all the business. LadyEarth, Apocalyps, Freedom Pullo and 16 others like this. Do you have a sheath for the op 2 weeks knife to be announced next week? LadyEarth, stjones, blackhat and 7 others like this. Aias and hydeinmind like this. evltcat and Murman like this. Well I thank you for the two sheaves that I had you make me, they are top notch. I have at least 5 knives on order from OPTWP2 , make that 6 if I go for a Hog Badger lol. I'll be ordering from you and Mr. Azwelke. Just wanted to save everyone some frustration. Apocalyps, Freedom Pullo, evltcat and 1 other person like this. Thanks for the information Dave. You make an awesome product, thanks. Ordering every O2W knife is a major financial commitment on your part and saves folks time and a ton of $$$ on insured 2-way shipping to send a knife in. You’ve been a huge resource for Busse owners for many years, and that kind of customer service is just one of the reasons why. Thanks David! BFS, Still Voracious, MacLaren1 and 1 other person like this. Thank you for the great custom Kydex!! in a new BB sheath drive me crazy! let us keep our beloved Busses in our hands! I think you need to grease the skids over in Wauseon a little better, my Battle Grade MOAB got delivered today! polskiogorki, Cjk526, Murman and 1 other person like this. I just got a sheath from Dave for a blade Jerry hasn't even thought of yet! back_inthe_saddle, 6850, Hard Knocks and 1 other person like this. Fantastic and Shipped Fast. David does great work! evltcat and 6850 like this. I had a sheath from "another maker" and it didn't work As Well. Key is your attention to detail. Very nice work as usual Mr. Brown. So what you are saying is that you got SK sheaths ready to ship? Does anybody anticipate the Infi Ratweiler to be any different in size from the last version? With respects to a Kydex sheath.